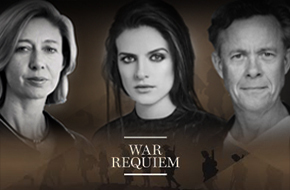 An historic performance of Benjamin Britten’s War Requiem by The Bach Choir on October 3rd at Westminster Cathedral will be supported by a cast of three celebrities speaking and reading about the horrors of war. The Requiem was Britten’s musical plea for peace. He chose The Bach Choir to perform on the first recording of the work almost 60 years ago and now once more they will be performing the work. As well as the Requiem with three soloists and The Philharmonia, the choir will be performing the work with extra material to be delivered by Christina Lamb OBE (who has first hand experience of conflict and has written about it extensively), actor Aisling Loftus (who appeared in War & Peace) and Alex Jennings (the actor who is remembered for, among other roles, his appearance as Benjamin Britten in Alan Bennett’s The Habit of Art at the RNT). The internationally famous Bach Choir will also be joined by the Staats-und Domchor Berlin and German soloist Benjamin Appl to commemorate the end of WW1 with a performance of Benjamin Britten’s War Requiem at Westminster Cathedral on Wednesday, October 3rd. Benjamin Britten’s War Requiem was composed in 1961 for the consecration of Coventry Cathedral – newly rebuilt following its destruction in the Second World War. Britten took as his inspiration the words of young English war poet, Wilfred Owen, himself killed in action on 4 November 1918, just days before the armistice. The War Requiem profoundly weaves together nine of Owen’s most poignant poems including Anthem for Doomed Youth, Futility and Strange Meeting, with the traditional Latin mass. A contemporary masterpiece, the War Requiem neither glorifies war nor celebrates its victories; Britten, a pacifist, dedicated the Requiem to four close friends – three of whom were killed during the Second World War.